A large variety of textile substrates can be enhanced by digital functionalization. The applied digital functionalization needs to be adapted to the needs of each and every special product. Our modular designs allow the integration of additional line components: Starting with a stand-alone printer, the integration of existing equipment at the customer‘s site or adding locally available line components for an economical layout is daily routine for ZIMMER AUSTRIA. Technology-oriented selection of the line components, in combination with the COLARIS platform, is the basis for printing and digital functionalization of fashion patterns, bed linen, decorative and uphostery textiles, protective textiles, shoes and sport materials. 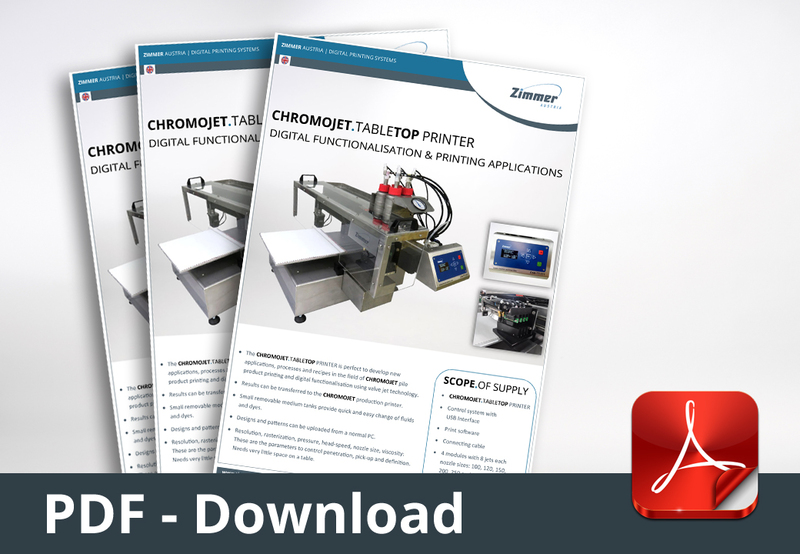 This lab printer is perfect to develop new applications, processes and recepies in the field of DIGITAL.FUNCTIONALITIES. 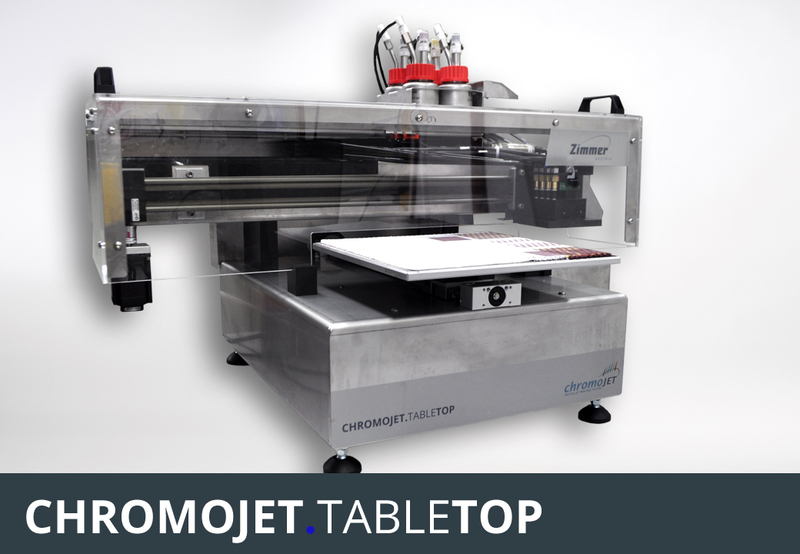 The results can be transferred 1:1 to the CHROMOJET production printer. Small removable medium tanks provide quick and easy change of fluids. Designs and patterns can be uploaded from a standard Personal Computer. Resolution, pressure, head speed, nozzle size and viscosity are parameters to control penetration, pick-up and definition. Linear printing speed at 25.4 dpi 0.7 - 0.9 m/min. 1.5 - 1.9 m/min. 2.7 - 3.4 m/min. 6.3 - 7.6 m/min.